Many people use the modern Japanese technique of reiki to heal their minds and bodies. The word “rei” (higher wisdom) and “ki” (life force energy) combine to describe the practice of wisely guiding life energy to relax, heal, and inspire. Though reiki is a spiritual practice, it doesn’t require people to adopt a belief system. In fact, some people may find it helps strengthen their existing beliefs. Reiki practitioners have facilitated healing in clients experiencing a variety of diseases and conditions; many people have used this practice in conjunction with Western medicine to decrease recovery times and lessen the severity of side effects. Mikao Usui, the founder of reiki, developed this technique in the early 20th century. He first experienced reiki energies on the 20th day of penance and fasting on Mt. Kurama (near Kyoto, Japan). Having achieved a spiritual awakening, he shared this healing energy with his family members and operated a popular healing clinic in Tokyo, which taught more than 2,000 students throughout Japan until Usui’s death in 1926. Reiki came to the U.S. with Hawayo Takata, who taught this art at several clinics in Hawaii. Before her death in 1980, she initiated 22 masters, who spread this practice across America. Today, more than a million reiki masters and 4 million practitioners benefit from and share this practice with the world. The energies reiki practitioners use bear similarities to the meridians of Chinese acupuncture and the Indian chakra system. Reiki energy breaks up negative energy and allows healthy energy to flow easily through a person’s body. 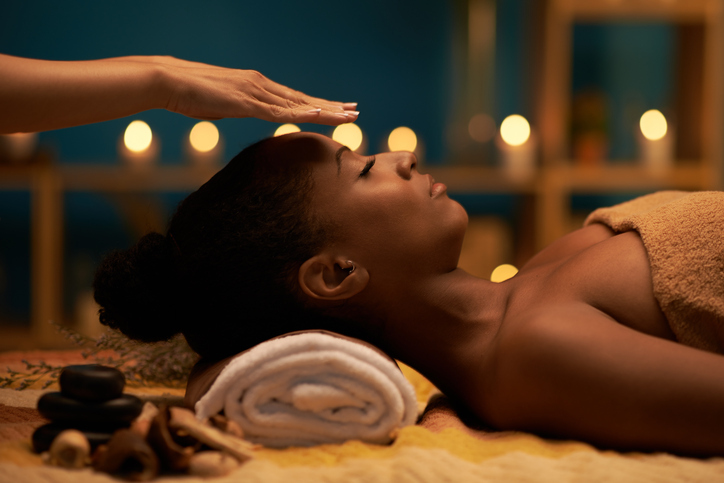 Like massage and bodywork practitioners, reiki masters use touch to transmit energy to clients’ bodies—particularly their hands, neck, and heads. Reiki energies exist in our minds, nervous systems, and in the auras which extend from our bodies. Massage therapists push toxins out of their clients’ soft tissues into their bloodstreams so their organs can filter out and eliminate these waste products. Massage and bodywork sessions increase clients’ flexibility and circulation while also reducing stress. Similarly, practitioners push energies through sluggish areas of the nervous systems to clear out negative thoughts and emotions. In particular, therapists may be able to help people remove unconscious energy blockages, increase their nervous system function, and facilitate healthy communication between mind and body—reducing stress and promoting healing. During typical reiki treatments, clients lie fully clothed on massage tables. However, reiki can also be received while seated or standing. Your practitioner will put their hands on (or close to) your head, shoulders, stomach, and feet. They may also perform the byosen reikan ho (byosen scanning) technique, which allows them to sense diseases and blockages within you. You can talk with your practitioner about your specific needs and goals for your session. Reiki practitioners hold each position for 3 to 10 minutes, depending on the amount of healing you require. Your entire healing session will typically last from 45 to 90 minutes. Reiki energies are believed to feel like a radiant, glowing light and may offer benefits for both the client and the practitioner. In addition to improving your physical health, reikisessions can also trigger powerful emotional and spiritual awakenings. Your practitioner will understand if you need to laugh, cry, or otherwise release your emotions. If you have a heart condition, consult your physician before booking a session. Some people who have experienced reiki may consider using it daily to heal their bodies, minds, and spirits. They report using the energy to prepare for the day, stay calm in busy traffic, relax after a long workday, and to help them fall asleep. This practical spiritual technique meshes well with daily activities like helping people, gardening, meeting with others, cooking meals, and spending time with family and pets. Self-treatments: Make a daily habit of taking 20 to 30 minutes to conduct reiki healing on yourself. You can use all of the traditional reiki hand positions or employ the byosen scanning technique to focus on the areas that need the most work that day. Experiment with various techniques, take notes on your progress, and develop a uniquely personal reiki practice for yourself. Reiki affirmations: Write your goals and desires on an index card. Then, hold the card in your hand and repeat your affirmation out loud while instilling reiki energy in the card. Make this a daily habit and keep your card with you at all times; you can energize it whenever you have a spare moment. “Go Against the Issue”: If you’re feeling courageous, refuse to avoid the activities you fear. When negative emotions arise, use reiki techniques to release and heal the associated areas of your energy body. You can lay hands on yourself, have a friend help, or direct these energies mentally (especially if you’re in public and using reiki to confront your social anxiety).